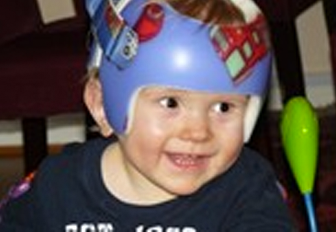 West Hampstead baby Alexander suffers from a condition called Plagiocephaly, also known as flat head syndrome. His parents, Maria and Morten, are keen to raise awareness of treatment available for the condition in the UK. Alexander is Maria’s second child. He was born weighing in at a very healthy 10lbs and 10oz. Maria noticed that her newborn baby’s head was misshapen from a very early age. A CT scan was undertaken on Alexander and he was diagnosed with both Plagiocephaly and Brachycephaly (a flattening of the head on one side). The plastic surgeon advised the couple to continue using repositioning techniques and to come back and see him within three months if the condition hadn’t improved. “We couldn’t help but worry – every parent wants their child to look perfect,” said Maria. Three months later, and with no change to Alexander’s head shape, the couple went back to see the plastic surgeon. He reassured Maria and Morten saying that eventually in most cases the condition would correct itself with age but that there was always the option of cranial remoulding. But because this is not available on the NHS, he couldn’t refer Alexander. Initially Maria sent a list of questions to a clinic based in Wimbledon called Technology in Motion. “I was so impressed with their speed of response, I received an email back from a clinician at the Centre the same day,” remembers Maria. “We decided to make an appointment for Alexander to see one of the clinicians at the Centre. When we went, we immediately felt at ease with the staff – they assessed his condition and advised us that, due to his severe condition, he would definitely benefit from cranial remoulding treatment. Both of us agreed very quickly that we wanted Alexander to go through the treatment programme.